The Ottawa Hospital is located on G12-501 Smyth Road. If you are interested in hearing more about this study or potentially participating, please contact our study coordinator, Miriam Muir. 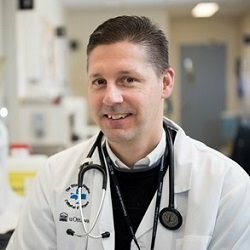 The Ottawa site is being led by Dr. Curtis Cooper, Associate Professor with the University of Ottawa, Infectious Diseases Consultant with the Ottawa Hospital Division of Infectious Diseases, Associate Clinical Researcher with the Ottawa Health Research Institute and Director of the Ottawa Hospital and Regional Viral Hepatitis Program. As a clinical researcher, his research activities encompass HIV, viral hepatitis, and vaccine development. His work is focused on the development of new therapeutic agents and the delivery of treatment that maximizes safety, adherence and safety.